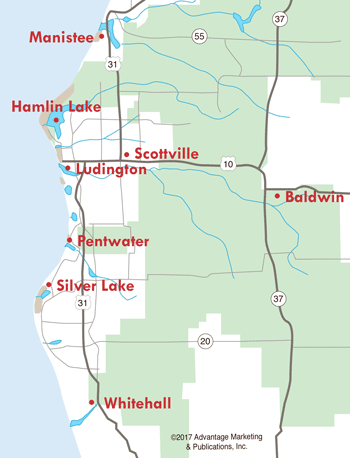 Whether it's fishing for salmon on Lake Michigan, trout in the PM River, or walleye in Hamlin Lake--we've got the best variety of fishing here in Ludington. And local tournaments give anglers a chance to add a little money to their pocket in addition to the fish in their bucket. No matter what time of year you want to cast a line, the Ludington area provides great fishing opportunities and plenty of fishing tournaments! 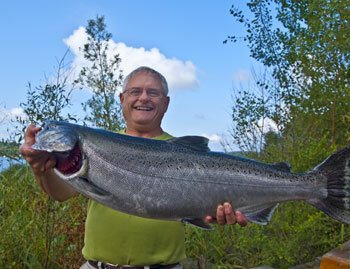 The State of Michigan offers two free fishing weekends every year, in February and June. In 2019, the weekends are February 16 & 17 and June 8 & 9. For two days, all fishing license fees are waived, though regulations are still in effect. It gives everyone the opportunity to try this great outdoor sport. Pere Marquette Expeditions of Ludington sponsors the Monster Pike Tournament January 26, 2019. Entry fee is $10, and the longest fish wins. The Pentwater Lake Perch Fishing Tournament is part of Winterfest in Pentwater and will take place February 16, 2019. Osborn's Sport Shop, Bear Lake, sponsors its annual Big Ice Fishing Tournament February 8, 2019. Pere Marquette Expeditions sponsors the Gettin' Jiggy Ice Fishing Tournament February 16, 2019 and coincides with the Free Fishing Weekend in Michigan. Also sponsored by Pere Marquette Expeditions is the Finny Slam Fishing Tournament, to be held March 9, 2019. The biggest tournament of the summer is the Ludington Offshore Classic, with cash and prizes given away. This year's event will be held July 18-24, 2019 and includes a Ladies Pro/Am, Youth Classic, a Big Fish Contest and the Classic Big Boys Contest. In the afternoon as the boats make their way in, hundreds head to Ludington's Waterfront Park to watch the weigh-in. The size of some of the fish are quite incredible. Autumn fishing in West Michigan is the best around--and you don't have to fight the crowds to catch the big one. 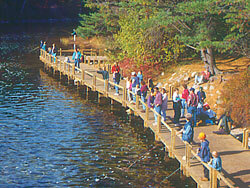 The fall salmon run at the Hamlin Dam within the Ludington State Park is the place to be, or try for brown trout and salmon in Pere Marquette Lake. From Big Sable Point down to Little Sable Point, the salmon and steelhead are there for the taking. With so many area lakes as well as Lake Michigan right in our backyards, area fishermen have a variety of Manistee County Fishing Tournaments to take part in each year in Manistee County, sponsored and hosted by different organizations.